A four part post series on the basics of using engineering compounds in high performance applications. So the parts are coming in slowly for my Element Team RSL build up. Let's cover how to properly assembly your bicycle at the very beginning. Doing a proper build from the beginning ensure reliability at the end. DNF at a race because you had a mechanical is not the way to win. You have to finish in order to win. You may not realize this, but many of the research and development done for aerospace applies directly to your high performance bicycle. Bicycles these days rely heavily on carbon fibre, high strength aluminum alloy, titanium fasteners, to keep the weight down but the performance up. Here are the 6 main chemicals/compounds needed to assemble the basics on your bike. Used to clean parts prior to assembly. Wet paper towels, q-tips to clean surfaces and threads. 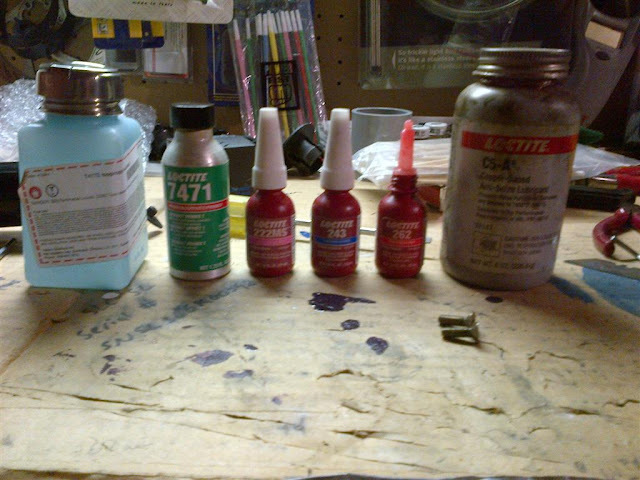 LOCTITE® 7471™ is used where increased cure speed of LOCTITE® anaerobic products is required. It is especially recommended for applications with passive metals or inert surfaces and with large bond gaps. LOCTITE® 7471™ is particularly recommended when prevailing temperature is low (<15 °C). inactive metals are non ferrous metals such as titanium, aluminum, black oxide coated steel fasteners, and certain stainless steel alloys. When using loctite 222 (low strength) thread locking compound, its formulation requires primer for in-active metals. Current formulations of 243 and 252 do not require primer for in-active metals. LOCTITE® 222MS™ is designed for the locking and sealing of threaded fasteners which require easy disassembly with standard hand tools. The product cures when confined in the absence of air between close fitting metal surfaces and prevents loosening and leakage from shock and vibration. Particularly suitable for applications such as adjustment of set screws, small diameter or long engagement length fasteners, where easy disassembly is required without shearing the screw. The thixotropic nature of LOCTITE® 222MS™ reduces the migration of liquid product after application to the substrate. Note the MS suffix just denotes it meets military specifications. shift lever/brake lever clamping bolts (remember the old school MTB trick to tighten very lightly the clamps so the brake lever and shifter can rotate during a crash. The loctite 222 will allow the bolt to retain the tension and not loosen over time i.e. during a race). The use is the same as the above Loctite 222MS, but for areas where high strength is required or in cases where the diameter of the threaded bolt is larger than say M8. This version of loctite (aka red) is never used for bicycles. It is permanent strength for small diameter fasteners and will cause small fasteners to snap off if taken apart with hand tools. To remove fasteners with permanent strength applied loctite requires heating of the fastener to melt the loctite. The only time I've used this for bicycles is for my Titanium Lynskey hard tail. Where the internal diameter of the seatpost is set for 31.6mm via an aluminum shim pressed inside the titanium seattube. The shim either was not properly manufactured or wore and creating a creaking noise every single time I touched the saddle. So I removed the crank and bottle bracket, the seatpost. hung the bicycle upside down and drenched the inside of the seattube with loctite to let it wick between the shim and the seatpost tube. Creak went away after that. The metal flakes inside the grease (copper or zinc or silver) acts as the sacrificial metal between two metals where one is more reactive than the other. Without the use of antiseize or some other form of thread treatment two metals will fuse together over time and form an oxide layer between them. Preventing removal of the fasteners. We mainly use antiseize for bolts that are dissimilar metals to prevent galvanic corrosion between the two metals and to prevent galling between male and female threads. Galling can be described as the cold welding of two naked metals surfaces when slid together under high pressure and force. Example brand new titanium frame with freshly cut BSA threads for BB cups. Aluminum bottom bracket cups. The two not having any threadlocker or antiseize and you installing the cup into the frame dry. You will never be able to remove the two without destroying 1 set of threads and having to chase the frame's bottom bracket shell with a tap. Stay tuned for Part 2 The case against antiseize and using threadlocker. Most useful thing about the Aluminium Curing Compound for assemble the bike has been shared by this post..This is the typical application include the original equipment and maintenance..